Today was the big day for workshop projects. I had the window painted and ready to go this morning. I didn’t find time to work on the workshop yesterday, so I set aside today to install the new window. The window is big, 4 feet by 5 feet. This morning I cut out the appropriate studs on the south side barn wall, and added a 2×6 header to support the wall. Then I took the big plunge, cutting the hole in the wall. There was no turning back at that point. I had to finish the project today or leave a big hole in the side of the barn. It was a hot day to be working in the workshop, but I got the new window installed. It adds a lot of light to the barn, and when open it allows a huge cross breeze. However, I am not totally finished. I need to add hinges and trim out the inside of the window. Overall, I’m pretty happy with how the project turned out. 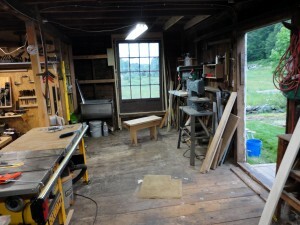 I made the sill from a piece of white oak I had beneath the barn. The rest of the framing was mostly pine. I was even able to get the trim installed and painted this evening. I’m not sure how it looks. That wall of the barn is leaning a little bit; I installed the window level (so it would open/close easily). It is pretty obvious from both sides that the window isn’t square with the wall (the un-square wall). I think if I ever reside the workshop, I’ll try to make the window less obviously out of line with the rest of the barn. Of course I’m at a loss on how to do that, so if anyone has any ideas, I’d love to hear them. Maybe next time I should add the windows so they line up with the unlevelness of the building. I also added a curtain inside (I had a curtain laying around). It is a south facing window, so I want to try to minimize how much sun I get in the summer. I love how much light it brings into the workshop. That corner of the shop had been pretty dark. And yes, as you can tell from the top picture, I still need to paint and trim the two top windows on that wall. I painted the trim around the window “Concord Buff” from Sherwin-Williams. 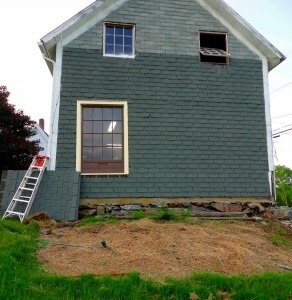 I’m thinking about painting the house that color, and I wanted to see how it matched up with the brown (the window is painted the same color as the accent color on the house trim – “Rookwood Dark Brown”). I don’t think the green shingles on the side are the nicest looking, but they work and residing the workshop isn’t in the plans for this summer.